DENVER — The driver of a car involved in a fatal motorcycle crash on W. Colfax Avenue Saturday night said he waited for traffic to clear before making a left-hand turn. The man, who declined to go on camera or to give his name, said he was driving his dad's car. He said he was eastbound on Colfax turning north onto Wolff Street when the crash happened. "I waited for traffic to clear," he said. "I noticed the light on the motorcycle about a block away. I started to turn and then all of a sudden the motorcycle was right there." Another witness told Denver7 that she stepped outside the nearby VFW Hall for a short cigarette break and noticed two motorcycles heading west on Colfax, one farther behind the other. "I didn't think, from what I observed, that the motorcycles were speeding," Arayala Santoro said. "I heard them yelling and talking... If they were really going that fast, they wouldn't be able to understand each other, it seems." Moments later, Santoro heard a loud crash and some popping noises. "I looked at the (traffic) light and it was still green for the motorcycles," she said, adding that she immediately called 911. Santoro said the operator told her to check the victims to see if she could perform CPR. She said she told them the male rider was badly injured and already deceased. She said she could hear the female talking for a short time, but that she too died. Another witness, who declined an on-camera interview, said she saw the motorcycle speed through the intersection. One woman, who saw security videotape of the crash, told Denver7 that it appeared to her that both the motorcycle and the car sped up to beat a yellow light. Denver police said they have no made an arrests related to the crash. Police are still interviewing witnesses and are checking security video. The city of Denver has a halo camera at that intersection. One witness told police the driver of the car was "combative," and that he was pulled out of the car by a group of people and beaten. The driver told Denver 7 that he got out of the car on his own. He said another individual approached him and that that individual was the combative one, not him. Police shut down W. Colfax Avenue between Winona Court and Xavier Street until 6 a.m. Sunday. 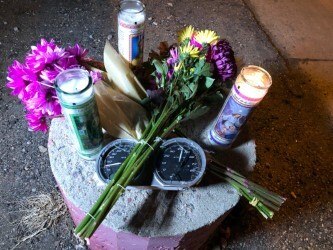 Flowers and candles now adorn the street corner where the fatal crash took place. This story is developing. Stay with Denver7 for updates.